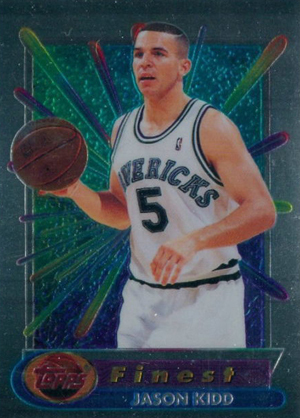 1994-95 Topps Finest Basketball is the sophomore installment of the high-end chromium brand. Boasting popular Refractors, a solid rookie crop and several inserts, the set remains a solid seller with collectors. 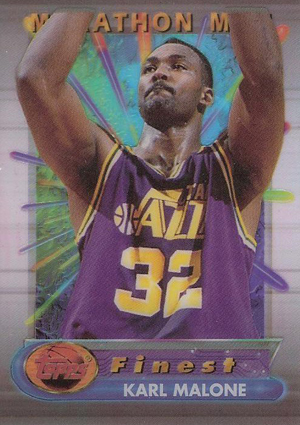 Split between two series, 1994-95 Topps Finest Basketball has 331 cards. The first has 165 cards. The second has the remaining 166 cards. Of the two, Series 2 is much stronger. It has all the rookie cards of Grant Hill, Jason Kidd, Eddie Jones, Jalen Rose, Juwan Howard and more. Michael Jordan is also in the second series. Base cards feature a the trademark chromium look and feel. A silver border gives way to an aqua-colored backdrop that has colorful comets shooting forward. The Topps Finest logo takes up the majority of the nameplate at the bottom of the card. The player's name is in small block letters at the very bottom. 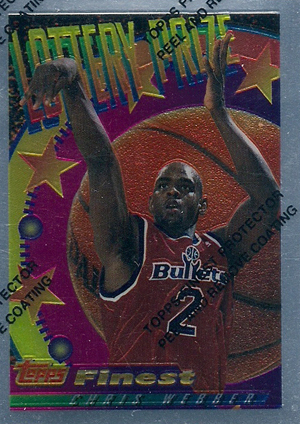 1994-95 Topps Finest Basketball has a pair of subset themes. Series 1 has City Legend cards while Series 2 has Collegiate Best cards. Base cards and most insert sets come with a protective coating. It can be peeled off, but most collectors have kept them in tact. 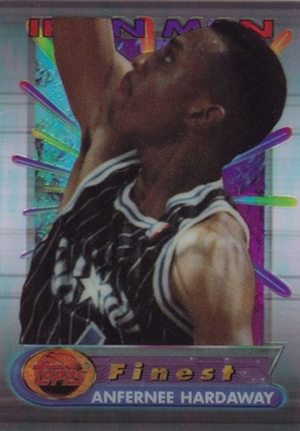 Inserts in 1994-95 Topps Finest Basketball have some unexpected themes, particularly in Series 1. Marathon Men (20 cards, 1:12 packs) and Iron Men (10 cards, 1:24 packs) honor those who logged lots of minutes and played in all 82 games. While the final checklists both have several superstars, there are also lots of less desirable names. Series 2 inserts hit the mark a little better. 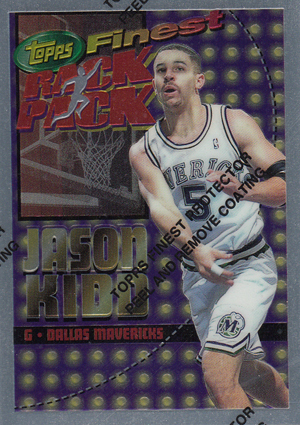 Lottery Prize (22 cards, 1:6 packs) looks back at some of the best lottery picks. Rack Pack (7 cards, 1:72 packs) has the top 1994-95 rookies. Finally, C0rnerstones (15 cards, 1:24 packs) takes on the best players from several franchises. 15 cards. Inserted 1:24 Series 2 packs. 10 cards. Inserted 1:24 Series 1 packs. 22 cards. Inserted 1:6 Series 2 packs. 20 cards. Inserted 1:20 Series 1 packs. 7 cards. Inserted 1:72 Series 2 packs. I think am the only one that writes about the PTPers refractor and test sets inserted in various topps basketball card packs. I keep on connecting the dots and I alwAys come up short somehow. Always that lingering unresolved question.I have all sets completed. And almost complete sets from all types of trading cards in the 1992-1996 time frame. 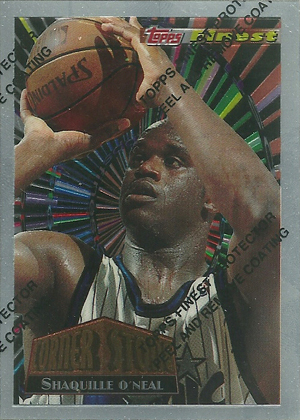 I have them replaced in containers holders and sheets with their own checklist.and always I have the no # PTPers header card of Michael J. Shaquille O Neal’s advance rainbow refractor for this year. And 25 topps finest cards .that I think are gold refractor because I have some refractor in those years in all my sets. And they dont have the R on back except Shaqs.now after i replaced the cards in their each designated spots according to owns checklist. Cards are piling without any sense cards not supposed to come outt that year. Others just doesn’t add at all. Now the variations and test and so called error is in the picture for resolutions.Then what about prototypes or samples sold. Add it up again.Now this will be redundant but with the digital reprinting of cards how can we really connec twhat is missing if missing are being printed and modified . The rare and singularities of cards is losing its edge.whas t this intentional for the cards authenticated .am 4 this but for me only on transactions if requested because I know mine are genuine. But if youhave extra money go for it but most or a few of us might not be able to keep paying for grade if items ate not bought. And some might not have accounts for any monetary transactions. A dilemma indeed. So am back to square 1 if not mistaken you wrote ..about accidentally or intentionally inserted very few in packs not where it belongs or it really doesn’t belong. And also the 1/1 cards (advance sample) .now I call the unknown variation (s) for my own placements and 4 all your headaches..why it came to this is 1 simple real incident with my close friend who collects sometimes like me . He has more and has more years expended in this hobby.I show my cards he buys immediately same cards as mine because he said was advertise as such. And stated I think he said ebay checks the products and will refund if fake was sold.I dont have a problem with it. But how could you buy 8-10 cards as test refractor and graded for $ 100 . a 1994 -1995 supposedly rare .and he got 10 ofthem. I told him and nothing happened except losing our voices from screaming with each other to prove our points.I told him about reprints. He answered it doesn’t matter my cards are graded and everybody has the same card .even when I pointed sameitems being sold 10 to 15 x more than his. Sameanswer mines graded and he just got a good deal. Okay Psa fees 10-15 $ per card do the math… ????. To me this was the pinnacle of designs by Topps Finest basketball. Led by the rookie cards of Kidd and Hill its a must have especially since its very affordable to collect unless your going after refractors.